I love a good mystery. (OK, I love a good mystery without too much gore, and with all characters I’ve come to love still alive at the end.) Anyway. 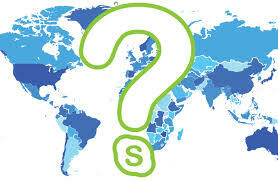 I also love the idea of Mystery Skype, both for what it is and what it could become. The basic premise of Mystery Skype is simple. You find a class to work with, on your own or through the Mystery Skype website. All you need is a computer with web access, a webcam, and a microphone. You can set up the parameters any way you want, but the game is essentially geographical 20 Questions. By asking a series of yes/no questions, students attempt to identify the location of their Mystery Skype partners. This is a good exercise in questioning, critical thinking, and basic geography, but like so many other opportunities for creative thinking, we add value if we ask, “And then what?” Now that you have a class partner in a very different place, how could you use that partnership in creative endeavors? Few things spur excitement and determination like a sense of audience. Imagine what Skype partners could do with some of these. Write collaborative stories. Each class writes a good beginning, then passes it off to the other. Switch as many times as seems productive. Share historical mysteries, puzzles, or little known events. Have both classes search primary sources online and come back together to share what they found. Share a math concept that is causing difficulty. Have the other class come up with a song, picture, or other creative option to help. Create demonstrations to teach science principles to the other group. The possibilities are nearly endless. As many of us approach the restlessness of spring days (and I continue to hold out hope spring will eventually come to Michigan! ), Mystery Skype may provide that extra boost of excitement to help students stay engaged. If you’d like to see it in action, take a look below. And if you take that next creative step, we’d love to hear about it!